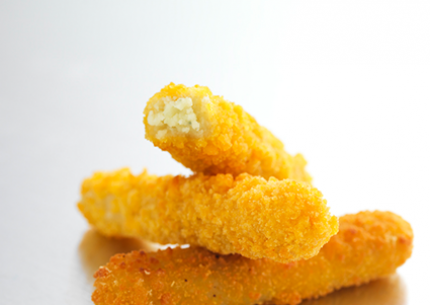 The delicious cheese stick with a golden and cripsy coating has a format ideal for all uses. Appreciated by all customers, in particular children or teenagers. To nibble both on the go and as part of a meal, either plain or accompanied by a salad or dipping sauce. For restaurants, as part of a meal to accompany a salad or as an alternative to other proteins like breaded fish or chicken. To heat up: In a 185°C oven or under the grill for 4 mins, or 2 mins in the deep-fryer. Cook from frozen. Coating 52% (wheat flour, sunflower oil, water, starches (wheat, potatoe), egg albumen, salt, yeast, spices, stabilizers: E461, rising agents :E500(ii),E450(i). 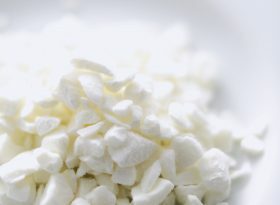 Goat’s cheese food preparation 48% (goat’s cheese 90% (milk), water, manioc starch, natural flavor (milk), salt). 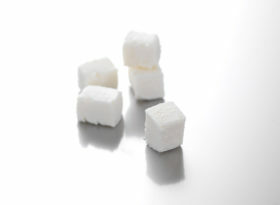 Pieces of creamy goat's cheese with a string and classic clean flavour.